We describe, in unprecedented detail, the petrosals and stapes of the docodont Borealestes from the Middle Jurassic of Scotland, using high resolution μCT and phase‐contrast synchrotron imaging. We describe the inner ear endocast and the vascularized interior structure of the petrosal, and provide the first endocranial view of a docodontan petrosal. Our study confirms some similarities in petrosal and stapedial morphology with the better known Haldanodon of the Late Jurassic of Portugal, including: (1) the degree of curvature of the cochlea; (2) multiple features related to the highly pneumatized paroccipital region; (3) the shape of lateral trough, the fossa of the M. tensor tympani, and the ridge on the promontorium; (4) the round shape of the fenestra vestibuli; and (5) overall morphology of the stapes. But Borealestes differs from Haldanodon in having a bony ridge that separates the tympanic opening of the prootic canal, the secondary facial foramen and the hiatus Fallopii, from the fenestra vestibuli. We identify two new vascular structures: the anterior and posterior trans‐cochlear sinuses, which traverse the pars cochlearis around the cochlear nerve (VIII). These trans‐cochlear sinuses have not been observed in previous docodont specimens, and could be an autapomorphy of Borealestes, or apomorphic for this clade. We also establish the anatomical relationship of the circum‐promontorium plexus to the inner endocast. The high quality of our scans has made these structures visible for the first time. Docodonta comprise an extinct branch of Mammaliaformes that falls outside crown Mammalia, but are closer to crown mammals than Sinoconodon, morganucodontans, haramiyidans and kuehneotheriids (Wible & Hopson 1993; Luo et al. 2002; Kielan‐Jaworowska et al. 2004; Martin 2005; Luo et al. 2015a). Docodonts retain the plesiomorphic association of the postdentary middle ear elements with the dentary in the postdentary trough (Lillegraven & Krusat 1991; Kielan‐Jaworowska et al. 2004; Ji et al. 2006; Meng et al. 2015). Docodonts also possess complex cusps and crests on their molars, creating shearing and crushing surfaces, providing many characters that distinguish them from most contemporaneous stem mammaliaform families (Averianov & Lopatin 2006; Luo & Martin 2007; Luo et al. 2015b). Their derived molar morphology (Kermack et al. 1987; Sigogneau‐Russell 2003; Meng et al. 2015; Schultz et al. 2017a) and very distinctive differences in postcranial skeletons are likely to have contributed to their wide ecological diversity during the Jurassic (Ji et al. 2006; Luo 2007; Meng et al. 2015). 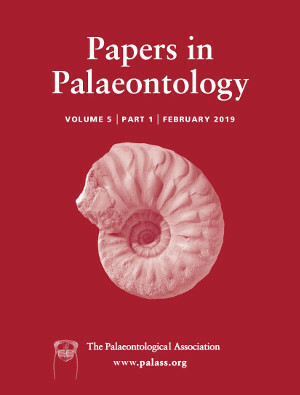 Recent analyses suggest that docodonts may be closely related to Woutersia and Delsatia among the stem mammaliaforms of the Late Triassic (Sigogneau‐Russell & Hahn 1995; Averianov & Lopatin 2006; Luo & Martin 2007). It was further proposed that docodonts may form a clade with Tikitherium (Datta 2005), to the exclusion of other Late Triassic mammaliaforms (Luo & Martin 2007). Members of Docodonta are found in the Middle Jurassic Bathonian of the UK and Russia (Waldman & Savage 1972; Lopatin & Averianov 2005), and from equivalent stratigraphic levels elsewhere in Eurasia (Ji et al. 2006). During the Late Jurassic, their distribution further expanded to North America, encompassing the entire Laurasian landmass (Simpson 1929; Krusat 1980; Pfretzschner et al. 2005; Hu et al. 2007; Martin et al. 2010; Rougier et al. 2015; Luo et al. 2015b). One taxon extended to the Early Cretaceous of Russia (Maschenko et al. 2002; Lopatin et al. 2009). The taxon Gondtherium from Toarcian sediments in India, was suggested to be docodontan. This would increase the geographical range of this group (Prasad & Manhas 2001 2007). However, the docodont affinity of Gondtherium has been challenged (Averianov et al. 2010). There were previously five docodonts for which reasonably complete cranial material is known: Docodon, Haldanodon, Castorocauda, Agilodocodon and Docofossor. Only the petrosal of Haldanodon has been recovered and described so far (Lillegraven & Krusat 1991; Ruf et al. 2013). Here we describe the petrosals of Borealestes, expanding the information on the cranial morphology of docodonts. Borealestes is the oldest docodont for which cranial material is known, and can thus shed light on the comparative morphology of the petrosal of docodonts as a whole. We used high‐resolution micro‐computed tomography (μCT) and digital reconstruction to explore the petrosal anatomy, and to generate an endocast of the inner ear of Borealestes. We compare these with the petrosal and inner ear of Haldanodon, and other key Mesozoic mammals for which the petrosals are known. This comparison provides important new information on the characteristics of the inner ear of a primitive docodont, and the evolutionary transformation from the simpler inner ear in early mammals in general (Luo et al. 1995), to the complex inner ear morphology (including coiled cochlea) of stem therians and crown Theria (Luo 2001; Ruf et al. 2009, 2013; Luo et al. 2011; Luo et al. 2016; Schultz et al. 2017b). The left petrosal of Borealestes, specimen NMS G.1992.47.121.2 is in the collections at the National Museum of Scotland (NMS) in Edinburgh, Scotland. It is part of the skeleton of Borealestes NMS G.1992.47.121.1 (which includes the right petrosal) recovered in 1972 by M. Waldman and R. J. G. Savage from the Jurassic limestone beds near Elgol, Isle of Skye. The exact location where the skeleton was recovered is yet to be determined (currently under investigation by EP), but the Kilmaluag comprises dolomitized blue–grey limestones, interbedded with calcareous siltstones and shales. Freshwater gastropods, bivalves, and ostracods (Viviparus, Neomidon, Unio, Darwinula and Theriosynoecum) indicate a freshwater, lagoonal environment (Andrews 1985; British Geological Survey 2011). The skeleton is believed to have come from ‘the vertebrate beds’, the strata that have yielded fossil lizards, crocodylomorphs, archosaurs, tritylodontids and mammals (Waldman & Savage 1972; Evans et al. 2005; Close et al. 2016; Panciroli et al. 2017a, b). NMS G.1992.47.121.1 is a fragmentary skeleton to which the left petrosal NMS G.1992.47.121.2 belongs, but from which it is now detached. The right petrosal is still part of the rock block of NMS G.1992.47.121.1. The skeleton has not yet been described, and is not identified to species level, but we confirm it belongs to the genus Borealestes (EP & Z‐XL, pers. obs. ; currently under study by EP). The left petrosal, along with several other bone fragments, was dislodged from the complete skeleton historically during handling, allowing them to be scanned and described separately. The right petrosal remained in situ with the skeleton. Micro‐computed tomographic data (μCT) of NMS G.1992.47.121.2 were obtained using the μCT scanner built in‐house at the University of Edinburgh, School of Geosciences Experimental Geoscience Facility. The scanner comprises a Feinfocus 10–160 kV dual transmission/reflection source, MICOS UPR‐160‐AIR ultra‐high precision air‐bearing table, Perkin Elmer XRD0822 amorphous silicon x‐ray flat panel detector and terbium doped gadolinium oxy‐sulfide scintillator. The scan resolution is 8.9 μm. Data acquisition software was written in‐house, and scans were reconstructed using Octopus 8.7 software (https://octopusimaging.eu/). Phase‐contrast synchrotron data from NMS G.1992.47.121.1 were obtained at the European Synchrotron Radiation Facility (ESRF), Grenoble, France. This produced data with a scan resolution of 6.15 μm, which was subsequently resampled to 12.3 μm. These data were then digitally reconstructed and image processed using Mimics 19.0 at the National Museum of Scotland (https://www.materialise.com/en/medical/software/mimics). Digital reconstructions are available in the Dryad Digital Repository (Panciroli et al. 2018). Raw data are part of a dataset comprising the fragmentary skeleton NMS G.1992.47.121.1, currently under study by EP. The complete raw dataset will be available upon completion of this work and subsequent publication. NMS, National Museums Scotland, Edinburgh, UK. NMS G.1992.47.121.2 (Figs 1B–E, 2) is the separated left petrosal of Borealestes. The lateral trough, the mastoid region and the associated structures are not preserved in this petrosal. The pars cochlearis is also incomplete, missing the anteromedial portion (Figs 1D–E, 2F). Nonetheless, the promontorium, or ventral eminence of the pars cochlearis, is relatively well preserved and shows many surface features (Fig. 2C–E). The right petrosal (Figs 1F–G, 3-6) is considerably better preserved in the lateral trough, the cavum epiptericum, the prootic groove structure, and in the paroccipital and mastoid regions. All of these structures are consistent with those identified in the petrosals of the docodont Haldanodon (Ruf et al. 2013). In the following, we describe each of the petrosal structures by referring to both petrosals. Figure 1 Open in figure viewerPowerPoint Petrosals of the docodont Borealestes. Photos and digital reconstructions from μCT and synchrotron scans. A, approximate positions of preserved petrosals in schematic skull outline of docodont (simplified from Haldanodon, partly based on Ruf et al. 2013). B–E, left petrosal NMS G.1992.47.121.2: B, photo of left petrosal in ventral view; C, digital reconstruction in ventral view showing crushing and dislocated fragments inside petrosal; D, photo of left petrosal in endocranial view; E, digital reconstruction of the endocranial view showing fragments inside petrosal. F–G, right petrosal NMS G.1992.47.121.1: F, photo of right petrosal in endocranial view; G, digital reconstruction of right petrosal in endocranial view with main features labelled for orientation. H–I, μCT‐scan slices with main features labelled and approximate position of slice picture shown in inset: H, left petrosal NMS G.1992.47.121.2; I, right petrosal NMS G.1992.47.121.1. Abbreviations: a, anterior; LSC, lateral semi‐circular canal; p, posterior; PSC, posterior semi‐circular canal. Scale bar in 1A represents 5 mm, all other scale bars represent 1 mm (scale bar in B also refers to C–G). Figure 2 Open in figure viewerPowerPoint Left petrosal of the docodont Borealestes NMS G.1992.47.121.2. Digital reconstructions from μCT scan. A–B, semi‐translucent views of interior structures of the left petrosal in: A, ventral; B, endocranial view; blue = vascular structures; yellow = nerves; brown = inner ear endocast. C–F, exterior surface structure with repositioned stapes (lilac), and periphery of fenestra vestibuli and crista interfenestralis (pink): C, dorso‐lateral view (tilted); D, medial view (tilted); E, ventral (external) view; F, dorsal (endocranial) view. Arrows indicate anterior direction. Abbreviations: a, anterior; p, posterior. All scale bars represent 1 mm. Figure 3 Open in figure viewerPowerPoint Right petrosal of the docodont Borealestes NMS G.1992.47.121.1. Digital reconstructions from synchrotron scan. A–B, semi‐translucent views of interior structures of the right petrosal in: A, ventral; B, endocranial view; blue = vascular structures; yellow = nerves; brown = inner ear endocast. C, major exterior structures preserved on the endocranial aspect of the right petrosal. More detailed identification shown in stereo paired images in Figure 4. Arrows indicates anterior direction. Abbreviations: a, anterior; p, posterior. Scale bars represent 1 mm. Figure 4 Open in figure viewerPowerPoint Stereo pairs of right petrosal of the docodont Borealestes NMS G.1992.47.121.1. Endocranial view from digital reconstructions of synchrotron scans. Exterior structures preserved on the endocranial (internal) aspect of the right petrosal. A, dorsal view (stereo pair). B, dorsolateral view (stereo pair). The petrosal has a major fracture (fault) indicated by dashed‐line that cuts through the bone, along the prootic sinus groove, and then the cavum supracochleare that contained the geniculate ganglion. Further anteriorly, distortion by the same fault compacted the cavum epiptericum for the trigeminal ganglion, compressing this structure into a narrow space. Arrows indicate anterior direction. Abbreviations: ASC, anterior semi‐circular canal; LSC, lateral semi‐circular canal; p, posterior; PSC, posterior semi‐circular canal. Scale bar represents 1 mm. Colour online. Figure 5 Open in figure viewerPowerPoint Right petrosal of the docodont Borealestes NMS G.1992.47.121.1. Digital reconstructions of ventral view from synchrotron scan. External surface structures with the stapes restored to the fenestra vestibuli, and displaced promonotium fragments repositioned. A, ventrolateral view; B, ventromedial view. For full structural identifications see Figure 6. The petrosal is associated with a broken and displaced strip of the squamosal. Arrows indicate anterior direction. Abbreviation: p, posterior. Scale bars represent 1 mm. Colour online. Figure 6 Open in figure viewerPowerPoint Stereo pairs of the right petrosal of the docodont Borealestes NMS G.1992.47.121.1. Ventral view from digital reconstructions from synchrotron scans. Exterior structures preserved on the ventral aspect of the right petrosal. A, ventrolateral view (stereo pair); B, ventral view (stereo pair). The petrosal has a major fracture (fault) indicated by dashed‐line that cuts through the bone along the prootic groove and its canal, and then through the cavum supracochleare that contained the geniculate ganglion. This has distorted the cavum supracochleare and dislocated the opening of the secondary facial foramen. Further anteriorly the same fault compacted the cavum epiptericum for the trigeminal ganglion, and compressed this structure. The lateral flange of the petrosal is broken, and only shown in its remaining and broken edge. The associated and incomplete strip of squamosal is displaced. A piece of petrosal anterior lamina, and the broken piece of the promontorium are omitted from these renderings. The solid lines with arrows indicate the interpreted courses of superior ramus of stapedial artery (via pterygo‐paroccipital foramen), the arteria diploetica magna (via the post‐temporal canal) and the ascending vessel of temporal region from the confluence of these two vessels. Arrows indicate anterior direction. Abbreviation: p, posterior. Scale bar represents 1 mm. Colour online. A bony ridge is visible on the anterolateral aspect of the promontorium (Figs 2E, 5A). This promontorium ridge is better preserved on the right petrosal than the left. The main part of the promontorium bulges anteromedially and ventrally, best shown in the left petrosal (Fig. 2). On the right petrosal, a piece of promontorium is broken but has been digitally restored (Fig. 5). The bone is better preserved in the apical region of the pars cochlearis of the right petrosal (Fig. 5). However, an area of the endocranial surface is missing on the internal surface of the anterior pars cochlearis of the right petrosal. The entire apical region is broken off on the left (Fig. 2). These breakages help to expose the tiny foramina of the circum‐promontorium plexus on the interior surface of the cochlear canal (Figs 2F, 3C). The crista interfenestralis is present, separating the fenestra vestibuli from the perilymphatic foramen and connecting the promontorium with the more posteriorly located mastoid region in complete petrosals, as in other Mesozoic mammals (Rougier et al. 1996; Ruf et al. 2009, 2013; Luo et al. 2012). The crista interfenestralis is intact in the right petrosal (Figs 5A, 6), but on the left petrosal (Fig. 2) it is fractured and collapsed into the hollowed inner ear space of the petrosal. Despite this, it can still be recognized without question, and has been digitally restored to its original position (Fig. 2C–F). The left petrosal shows several posterior openings of the inferior petrosal sinus canal, anteromedial to the perilymphatic sulcus (and also anterior to the jugular notch) on the posteromedial corner of the promontorium (Fig. 2). Of these, the first opening is large, and anteromedially located. This opening is connected to the inferior petrosal sinus, enclosed in a thick bony canal along the medial edge of the pars cochlearis. This is termed the opening of the inferior petrosal sinus. A second, smaller opening is located lateral to the first opening, and this tiny foramen is also connected to a small tributary channel networked with the inferior petrosal sinus (Fig. 2). These surface foramina can be traced to the inferior petrosal sinus in the medial (or inferior) part of pars cochlearis, as in the petrosals of the docodont Haldanodon and other Mesozoic mammals (Wible 1990; Rougier et al. 1992, 1996; Ladevèze & de Muizon 2007, 2010; Luo et al. 2012; Ruf et al. 2013). The bony canal of the large inferior petrosal sinus is only preserved partially on the left petrosal, and both its anterior part (near the apex of pars cochlearis) and its posterior section are broken (Fig. 2). The broken posterior part of the inferior petrosal sinus canal is connected to a trans‐cochlear sinus channel (described below). Of the three openings connected to inferior petrosal sinus, the posterior‐most opening is also the opening of the posterior trans‐cochlear sinus. The interpretation of how the inferior petrosal sinus is connected to the trans‐cochlear sinus channel is based on the left petrosal, as the medial edge of the pars cochlearis where the inferior petrosal sinus would be located has been eroded in the right petrosal. In both the left and right petrosals, we have visualized and identified two vascular channels that traverse the pars cochlearis through the bone, respectively called the anterior trans‐cochlear sinus, and the posterior trans‐cochlear sinus (Figs 2, 3, 7). The anterior trans‐cochlear sinus channel is confluent with the posterior end of the inferior petrosal sinus (Figs 2A, B), but the posterior trans‐cochlear sinus has its own opening on the posteromedial corner of the promontorium (Figs 2A, D–E). In the right petrosal, because the media edge containing the canal of the inferior petrosal sinus has been eroded and lost, the two openings of the anterior trans‐cochlear sinus and the posterior trans‐cochlear sinus appear well separated (Fig. 3). Figure 7 Open in figure viewerPowerPoint Endocasts of interior structures of petrosals in Borealestes. A–D, left petrosal NMS G.1992.47.121.2: A, ventral view of the preserved inner ear endocast, with blood vessels and nerves; B, endocranial view the inner ear, with blood vessels and nerves; C, inner ear in ventral view (as preserved, incomplete), without vessels or nerves; D, inner ear in endocranial view (as preserved, incomplete) without vessels and nerves. E–H are of right petrosal NMS G.1992.47.121.1: E, ventral view of the preserved inner ear endocast, with blood vessels and nerves; F, endocranial view the inner ear, with blood vessels and nerves; G, inner ear in ventral view (as preserved, incomplete), without vessels or nerves; H, inner ear in endocranial view (as preserved, incomplete) without vessels and nerves. Blue = vascular structures, yellow = nerves. Abbreviations: a, anterior; ASC, anterior semi‐circular canal; LSC, lateral semi‐circular canal; p, posterior; PSC, posterior semi‐circular canal. Arrows indicate anterior direction. All scale bars represent 1 mm. The bony floor of the lateral trough is only partly preserved in the left petrosal (NMS G.1992.47.121.2) but is more complete in the right petrosal (NMS G.1992.47.121.1). The lateral flange is preserved as a broken edge on the right petrosal, and is altogether lost in the left petrosal (Figs 2, 5, 6). The following structures can be identified in the posterior part of lateral trough: the hiatus Fallopii for the greater petrosal nerve; the secondary facial nerve foramen (on the lateral wall of cavum supracochleare); and a large opening for the confluent prootic canal and the tympanic opening of the posterior trans‐cochlear sinus channel (Figs 2, 3). We also interpret a shallow depression area anterior to the fenestra vestibule, and near the opening of the hiatus Fallopii, as the fossa for the tensor tympani along the posterior rim of the lateral trough. The depression we have interpreted as the tensor tympani fossa is similar in location to the tensor tympani fossa identified in the petrosals of Cretaceous multituberculates, and in the Cretaceous triconodontid from the Cloverly Formation (Wible & Hopson 1993, fig. 5.3; see also Wible & Hopson 1995, figs 7, 8). Posteromedially, a bony ridge separates the prootic canal, secondary facial foramen and hiatus Fallopii from the fenestra vestibuli, forming part of the latter's anterior rim. The secondary facial foramen is anterior to the prootic canal opening. The crista interfenestralis is crushed and displaced dorsally in the left petrosal NMS G.1992.47.121.2, distorting the original shape and proportions of the fenestra vestibuli and the perilymphatic foramen (Figs 1C, 2E). Although the crista interfenestralis is better preserved in the right petrosal, the promontorial roof in this region is broken. The lateral periphery of the fenestra vestibuli is also broken. The preservational defects have distorted the shape of the fenestra vestibuli. The preserved shape of stapedial foot plate (described below) can give a reliable approximation to the shape of the fenestra vestibuli. We digitally repositioned the fragments of the crista interfenestralis of specimen NMS G.1992.47.121.2, to partially restore the periphery of the fenestra vestibuli. Based on the restoration, we interpret the fenestra vestibuli as being more or less round in circumference, as reflected in the shape of the stapedial footplate (Figs 2, 5, 8). Both the fenestra vestibuli and the perilymphatic foramen are large, relative to the size of the promontorium. The fenestra vestibuli is positioned posterolaterally to the promontorium, and the perilymphatic foramen is posterior to the promontorium. Figure 8 Open in figure viewerPowerPoint Stapes of the docodont Borealestes. A–G, preserved parts of the left stapes NMS G.1992.47.121.2: A, left stapedial footplate (fractured and incomplete) in external view (from the inner ear space); B, left stapedial footplate (fractured and incomplete) in the internal view (toward the inner ear space); C, fragments of crura associated with the left stapedial footplate; D, approximately dorsal; and E, ventral side views of left stapedial footplate; F, interpretive reconstruction of external view of left stapedial footplate; G, interpretive reconstruction of crura from their fragments; H, interpretive reconstruction of side view of left stapes. I–O, preserved parts of the right stapes NMS G.1992.47.121.1: I, right stapedial footplate (incomplete) in external view (from the inner ear space); J, right stapedial plate (incomplete) in the internal view (toward the inner ear space); K, fragments of crura associated with the right stapedial footplate; L, approximately dorsal; and M, ventral side views of right stapedial footplate, showing the crural bases; N, interpretive reconstruction of the outline of right stapedial footplate in external view; O, interpretive association of crural fragments with their bases on footplate; P, interpretive reconstruction of side view of right stapes. All reconstructions based on remaining portions of stapes of NMS G.1992.47.121.1 and NMS G.1992.47.121.2, and the stapes of Haldanodon (Ruf et al. 2013). Scale bars represent 1 mm. A perilymphatic sulcus for the perilymphatic duct (aquaeductus cochleae) is present in both petrosals. This sulcus connects the perilymphatic foramen and the margin of the jugular foramen (Figs 2E, 5, 6). This is similar to other stem mammals and several Mesozoic clades of crown mammals (Kermack et al. 1981; Crompton & Luo 1993; Wible & Hopson 1993; Lillegraven & Hahn 1993; Wible & Hopson 1995; Rougier et al. 1996; Luo et al. 2001). The jugular foramen is only represented by its margin on the petrosal; the medial periphery of this foramen is not preserved in this specimen. In the endocranial aspect of the digital reconstruction, the osseous cochlear canal is visible in both petrosals because the anterior part of the pars cochlearis is broken, although less severely in the right, than in the left petrosal (Figs 1D–G, 2, 3). Minute foramina for blood vessels and sinuses are visible on the interior surface of the cochlear canal (Figs 2F, 3C), which we interpret to be connected to the circum‐promontorium sinus plexus (sensu Kermack et al. 1981) inside the bone covering the pars cochlearis (visible in the endocast, see endocast section below). We can trace this network of small vessels (Figs 2A; 7A, B, E, F). Additional small nutritive foramina connected to these small vessels are also visible on the endocranial surface of the petrosal (Fig. 2F). The internal auditory meatus is well preserved in both petrosals. The primary foramen for the facial nerve (VII) to enter the internal auditory meatus can clearly be identified, and can be traced to the incomplete cavum supracochleare that houses the geniculate ganglion (Figs 2F, 3C, 4) (Rougier et al. 1992, 1996; Ruf et al. 2013). The foramen for the cochlear nerve (VIII), and laterally to that the foramen for the vestibular nerve (VIII), are present. This structure is only partly preserved and can be clearly recognized in the left petrosal (NMS G.1992.47.121.2) (Fig. 2C–F). In the right petrosal (NMS G.1992.47.121.1), a fault‐line has cut through this region, where the bone is also crushed laterally (Fig. 4, dashed line). The hollowed open space of the cavum supracochleare, as seen on the left, is crushed on the right petrosal. The large secondary facial nerve foramen is preserved in a similar position on both petrosals. This foramen is the exit of the facial nerve from the cavum supracochleare. On the left petrosal, the bone of the suprafacial commissure is broken, so the entire path of the facial nerve can be traced from the internal auditory meatus to the cavum supracochleare, and further from the cavum through to the secondary facial foramen. In the left petrosal the prootic sinus groove continues as a prootic canal, perforating the petrosal just posterior to the cavum supracochleare. In the right petrosal, the bone in the area where the prootic groove would join the space of cavum supracochleare is distorted by crushing and displacement along the fault line that cuts through the prootic groove and the cavum supracochleare. As a result of this distortion, the relationship of these two structures is obscured in the right petrosal. Largely based on the location of the prootic canal opening on the external (tympanic) aspect of the left petrosal, we interpret the prootic sinus as traversing through the cavum supracochleare in a similar manner in the right petrosal (Wible & Hopson 1995). In the reconstructed dorsal‐to‐ventral sequence, the prootic sinus vein diverges from the sigmoid sinus at the top the subarcuate fossa. It then follows the prootic sinus groove along the lateral margin of the subarcuate fossa (Fig. 4), and enters the petrosal near the cavum epiptericum (Fig. 2). Inside the petrosal, the prootic sinus joins the lateral end of the posterior trans‐cochlear sinus, before it enters the tympanic cavity through the prootic canal opening (Figs 2, 7A–B). Distally, the prootic sinus connects with the lateral head vein (Wible & Hopson 1995). The cavum epiptericum, a bony space formed by the petrosal that houses the trigeminal ganglion of cranial nerve V, is preserved on the right petrosal (Figs 3, 4), but completely lost to damage on the left petrosal. Medially, the cavum epiptericum is separated from the internal auditory meatus by a saddle‐shape structure known as the suprafacial commissure (Figs 3C, 4). Posteriorly, the cavum epiptericum is separated by a sliver of bone from the cavum supracochleare, but both the cavum epiptericum and the cavum supracochleare are in the same broader depression formed by the petrosal. This pattern is similar to features on the endocranial aspect of the petrosal in Haldanodon (Lillegraven & Krusat 1991) and Morganucodon (Kermack et al. 1981; Graybeal et al. 1989). This differs slightly from the petrosal of the Jurassic triconodontid Priacodon, in which the semilunar recess (related to the cavum epiptericum) is a large concave structure, in close proximity to the endocranial opening of the prootic canal (Rougier et al. 1996, fig. 1). The cavum supracochleare for the geniculate ganglion is present in Priacodon, but the bony floor of this space is interpreted as absent (Rougier et al. 1996, p. 9), a feature that also differs from the structure of Borealestes (Figs 3, 4). The paroccipital region of the petrosal is relatively well preserved in the right petrosal, NMS G.1992.47.121.1 (Figs 5, 6). The anterior part of the paroccipital region is elevated from the rest of the petrosal. Its most notable structure is the Y‐shaped crest of the crista parotica. We interpret the presence of a fossa incudis: a shallow depressed area accommodating the incus, which serves as the contact point of the incus and the petrosal. On the lateral side of the anterior paroccipital process, there is a broad depression representing part of the entoglenoid recess between the petrosal and the cranial moiety of the squamosal (Figs 5, 6). The posterior paroccipital process is excavated by a large and deep paroccipital pneumatic recess (sensu Ruf et al. 2013). The stylomastoid notch, which is the exit of the facial nerve from the tympanic region, is located medially to the base of the posterior paroccipital process (Fig. 6). The stapedial muscle fossa is a deep pit located posterior to the fenestra vestibuli and anteromedial to the posterior paroccipital process. The mastoid pneumatic recess is a deep excavation into the paroccipital‐mastoid region of the petrosal, and is located medial to the stapedial muscle fossa and posterolateral to the perilymphatic foramen (Figs 5, 6). These petrosal structures of Borealestes are identical to those in the petrosal of the docodont Haldanodon, as described by Ruf et al. (2013), with the four deeply excavated structures of the petrosal (paroccipital pneumatic recess, the stapedial fossa, the mastoid pneumatic recess, and the entoglenoid recess (partly on petrosal)) all strikingly similar between these two taxa. The right petrosal (NMS G.1992.47.121.1) also preserves the bony channels and grooves for the arterial system from the superior ramus of the stapedial artery from the tympanic cavity and the arteria diploetica magna from the occiput (Wible 1990; Rougier et al. 1992; Wible & Hopson 1995). The pterygo‐paroccipital foramen is located anterior to the crista parotica (Fig. 6). The foramen is represented by an open notch because the lateral border of this foramen is broken in this petrosal of Borealestes. By contrast, in the more complete petrosal of Haldanodon, the pterygoparoccipital foramen is fully encircled. This foramen is the passage for the superior ramus of the stapedial artery extant mammals and stem mammaliaforms (Wible 1990; Rougier et al. 1992; Wible & Hopson 1995). Dorsal of this foramen, the superior stapedial ramus follows an open groove lateral to the anterior paroccipital process and joins the arteria diploetica magna that enters through the post‐temporal canal (partially preserved in right petrosal) (Fig. 6). The superior ramus of the stapedial artery and the arteria diploetica magna would be confluent with each other to form the ascending artery housed by the ascending vascular canal on the lateral side of petrosal that is also a part of the temporal skull surface. In the petrosal of Haldanodon (Lillegraven & Krusat 1991; Ruf et al. 2013) these structures are not fully exposed, or not fully segmented from the CT scans. The bony structures related to this vasculature, as revealed by CT scanning of the petrosal of Borealestes, are generally similar to those reconstructed for Morganucodon, and other Mesozoic mammals (Wible 1990; Rougier et al. 1992; Wible & Hopson 1995; Luo et al. 2012). Both petrosals were crushed post mortem, with the right petrosal being more complete. In both cases the inner ear endocasts are somewhat distorted. The approximate position of the fenestra vestibuli and perilymphatic foramen are identifiable despite this. Although the apex of the cochlear canal is absent in specimen NMS G.1992.47.121.2, it is clear that the canal is curved (Figs 2A–B, 7A–D), and this is confirmed by the more complete cochlear canal of the right petrosal (Figs 3A–B, 7E–H). The degree of curvature/coiling is similar to that of Haldanodon (Ruf et al. 2013), which can be traced in the right petrosal of Borealestes. The high quality of our scans (at a resolution of 12.3 and 8.9 μm) permits the reconstruction of some vascular channels and networks of small blood vessels in the bone of the pars cochlearis (Fig. 7). Some of these networks of tiny vessels can be directly traced and shown to be connected to the structures inside the bony labyrinth (Figs 2, 3A–B, 7). A noteworthy feature of these is the circum‐promontorial sinus plexus (sensu Kermack et al. 1981) a network of tiny vessels (probably venous in nature) embedded in the pars cochlearis on the ventromedial side of the cochlear canal. This vascular network connects to the inferior petrosal sinus along the medial side of the promontorium (pars cochlearis) (Figs 2A, B; 3A, B; 7A, B, E, F). We also identify two relatively large vascular channels that traverse the bone of the pars cochlearis. We interpret these as probably venous in nature due to their full connections to other sinuses or veins (Figs 2, 3, 7). We have here termed these two major channels the anterior and posterior trans‐cochlear sinuses (Figs 2, 3, 7). The anterior trans‐cochlear sinus (a) connects medially with the inferior petrosal sinus. From there it traverses through the bone of the pars cochlearis and enters laterally into the space of the cavum supracochleare (Figs 2, 3), the space that houses the geniculate ganglion of the facial nerve. Inside the pars cochlearis the course of anterior trans‐cochlear sinus curves anteriorly around the bony internal auditory meatus. The opening for the secondary foramen of the facial nerve (VII) is very large in both left and right petrosals. This foramen could accommodate the passage of additional structure, such as the anterior trans‐cochlear sinus. We therefore offer a speculative interpretation that the anterior trans‐cochlear sinus exits through the enlarged secondary facial foramen, along with the facial nerve. The posterior trans‐cochlear sinus (p) starts in the posteromedial corner of the promontorium near the jugular notch, originating from a single large foramen in the left petrosal (Fig. 2), or in two foramina as in the right petrosal (Fig. 3). The bony course of this sinus is positioned more posteriorly than, and away from, the anterior trans‐cochlear sinus. It curves around the main opening of the internal auditory meatus, and between the cochlear nerve foramen and the vestibular nerve foramen (Figs 2, 3, 7). The posterior trans‐cochlear sinus is confluent with the prootic canal, suggesting that this sinus is connected to the prootic vein, before the prootic vein exits the petrosal into the tympanic region at the prootic canal opening (Fig. 2). The anterior and posterior trans‐cochlear sinuses are connected below the facial nerve geniculate ganglion in the cavum supracochleare, as shown in the right petrosal (Figs 3B, 7F). However, this confluence is not observed in the left petrosal, where anterior trans‐cochlear sinus and posterior trans‐cochlear sinus remain separate below the geniculate ganglion. This feature may be bilaterally variable, or the asymmetry may be an artefact of preservation. We also recognize a network of small vessels in the paroccipital region of the petrosal, just underneath the entoglenoid recess. This corresponds to the squamosal plexus (Ruf et al. 2013, fig. 4). Altogether, these venous features demonstrate a high degree of vascularization of the cochlea and surrounding osteological structures of the pars cochlearis, as initially observed in Haldanodon (Ruf et al. 2013). The internal auditory meatus on the endocranial aspect of the petrosals is relatively shallow, somewhat similar to that in the petrosal of Morganucodon (Kermack et al. 1981). The floor is divided by a low crest (crista falciformis) into a ventral depression for the large foramen of the cochlear nerve, and a dorsal depression for the primary facial nerve foramen and the foramen for the vestibular nerve (Figs 2F, 3C). The bony floor of the cochlear nerve foramen is preserved as a large and long slit in the right petrosal (Figs 1G, 3, 4) but this foramen appears to be broken widely open on the left petrosal (Fig. 2). The sulcus for the lagenar nerve as found in inner ear endocast in Haldanodon (Ruf et al. 2013, fig. 6) corresponds in position to part of the wide opening outline of the cochlear foramen in Borealestes. In the endocast of the right petrosal there is a suggestion of a possible lagenar nerve sulcus, but it cannot be conclusively identified in both petrosals of Borealestes due to lack of preservation. Due to breakage of the anterior part of the pars cochlearis in the left petrosal (NMS G.1992.47.121.2), the anterior part of the internal auditory meatus that would encircle the primary facial nerve foramen is incomplete in this specimen. Fortuitously, this helps to expose the entrance of the facial nerve (VII) into the petrosal, and the facial nerve's conduit leading to the space for the geniculate ganglion can be clearly identified (Fig. 2F). In our digital reconstruction, the vestibular nerve (VIII) appears to be close to the primary facial nerve and the geniculate ganglion (Figs 7B). This is because the primary facial nerve foramen is in close proximity to the foramen of the vestibular nerve (Figs 2F, 3C), and both are situated together in dorsal depression in the floor of the internal auditory meatus. In the petrosals of other mammaliaforms described so far, the passages of the vestibular nerve (VIII) and the facial nerve (VII) are clearly more widely separated (Kermack et al. 1981; Graybeal et al. 1989; Ruf et al. 2013; also pers. obs. on Sinoconodon and Hadrocodium). Among the bone fragments displaced into the interior of both petrosals (Fig. 1H, I), we recovered parts of the left and right stapes (Fig. 8). We identify a posterior and anterior stapedial crura, and crural fragments (Fig. 8). In the left petrosal, the stapedial footplate is fractured into three pieces which, we estimate, together constitute about 70% of the entire footplate (Fig. 8A–H). The reconstructed footplate has a nearly circular outline and is overall convex proximally toward the inner ear space. The lateral (external) aspect of the footplate is slightly concave, with curved edges around the periphery. The stapedial footplate recovered from the right petrosal (Fig. 8I–P) is more complete and confirms the position of the crura and the round shape of the footplate. The morphology of the bullate footplate resembles the stapes of Haldanodon (sensu Sánchez‐Villagra & Nummela 2001; Ruf et al. 2013). Both stapes show a central protruding bony knob preserved on the concave side (the lateral surface) of the footplate, which represents the base of the anterior crus (Fig. 8). We recovered additional separated pieces of bone that can be identified as fragments of the stapedial crura; the crural fragment coloured orange in Figure 8C (the middle fragment of the three) is most likely to be the lateral portion of the anterior crus. The two other fragments may be parts of the anterior or the posterior crus (Fig. 8G). The right stapes even has longer parts of each crus preserved in anatomical position, which indicate a square outline of the stapedial head (Fig. 8I–P). In addition, we interpret the rather bulbous fragment (Fig. 8K, blue coloured left‐hand fragment) recovered from the right petrosal as part of the stapedial head (Fig. 8O). The stapedial footplate has a length of approximately 0.8 mm, and width of approximately 0.6–0.7 mm (based on measurements of both stapedial footplates), giving it a stapedial ratio of 0.75–0.86. However, the exact ratio is not certain due to the broken periphery of the footplate. The petrosal and endocast of Borealestes is morphologically similar to that of Haldanodon, but there are some key differences that separate the two genera. A bony ridge visible on the anterolateral aspect (Figs 2E, 4A, 6) corresponds to a similar bony ridge in the same position on the petrosal of Haldanodon (Ruf et al. 2013). The anterior part of the cochlear canal is clearly curved, and the apical region of the curved cochlear canal is slightly inflated, as can be determined in the right petrosal of Borealestes (Fig. 7E–H). Both of these features on the right inner ear endocast are consistent with the incomplete inner ear endocast on the left side. The degree of curvature/coiling and apical inflation appears similar to that of Haldanodon (Ruf et al. 2013). In Haldanodon, the anterior rim of the fenestra vestibuli is separated from the tympanic openings of the prootic canal, the secondary facial foramen, and from the hiatus Fallopii (Ruf et al. 2013, fig. 2). In the same region of petrosal of Borealestes, the fenestra vestibuli is also separated from these structures. However, Borealestes has an elevated crest in continuation with the bony ridge of the promontorium on the left petrosal (the same region is damaged on the right petrosal). This crest separates the fenestra vestibuli and the prootic canal opening (Fig. 2C, E). Such a crest is not present in Haldanodon and therefore Borealestes is different in this feature. The morphology of the stapedial footplate is bullate as in Haldanodon (sensu Sánchez‐Villagra & Nummela 2001; Ruf et al. 2013). In their description of the stapes of Haldanodon exspectatus, Ruf et al. (2013) reconstructed the stapes as having parallel anterior and posterior crus, with a large stapedial foramen. This is consistent with cynodonts and stem mammals for which the stapes is known (Novacek & Wyss 1986; Lillegraven & Krusat 1991; Allin & Hopson 1992; Crompton & Luo 1993; Luo 2007; Gaetano & Abdala 2015; Schultz et al. 2018). The stapedial footplates of Haldanodon and Borealestes are now almost equally well‐known. In Haldanodon, the stapedial head is smaller than the stapedial footplate, the anterior crus is in central position, and the posterior crus is on the rim of the stapedial footplate. The rim of the stapedial footplate is slightly curved upward (bullate shape) and the stapedial footplate is basically round. Because Borealestes and Haldanodon are both docodonts, and phylogenetic analyses indicate they are closely related within a subclade of docodonts (Ji et al. 2006; Luo & Martin 2007; Averianov et al. 2010; Ruf et al. 2013; Luo et al. 2015b; Schultz et al. 2018), our reconstruction of the stapes of Borealestes (augmented by information from that of Haldanodon) is justifiable on a phylogenetic basis (Fig. 8H, P). New key features identified in both petrosals of Borealestes are the two vascular sinuses that traverse the pars cochlearis: trans‐cochlear canal anterior (a) and trans‐cochlear canal posterior (p) (Figs 2A–B, 3A–B, 7). These connect to the large channels of the inferior petrosal sinus; the venous vessels extending in an anteroposterior direction along the medial side of the pars cochlearis of the petrosal. Within the bone of the pars cochlearis, the trans‐cochlear canals are also connected to the circum‐promontorium plexus. The inferior petrosal sinus is a major vascular structure in petrosals among Mesozoic groups of crown mammals (Rougier et al. 1992; Rougier et al. 1996; Luo et al. 2012; Hughes et al. 2015). For crown therians, this feature is well documented in Cretaceous and Paleocene metatherians (Wible 1990; Ladevèze & de Muizon 2007, 2010). In the petrosals of Borealestes, the channel for the inferior petrosal sinus, the circum‐promontorium plexus, and the two trans‐cochlear vascular sinuses (Figs 2A, B; 3A, B; 7A, B, E, F), form a well‐developed vascular network. This corroborates earlier observations that the petrosals of docodonts are highly vascularized, more so than that of Morganucodon (Kermack et al. 1981; Graybeal et al. 1989). In extant monotremes, the petrosal does not have the heavy vascularization in these regions, in contrast to Haldanodon and Borealestes’ extensive vascularization throughout the petrosal (Kuhn & Zeller 1987; Ruf et al. 2013). The trans‐cochlear sinuses in the petrosal of Borealestes are newly recognized anatomical features. Either these are unique features (autapomorphic) of Borealestes, or they could be derived features (apomorphic) of docodonts as a whole if their presence can be confirmed by re‐scanning and re‐segmenting the petrosal of Haldanodon, or petrosals of other docodonts. These two sinuses are also interesting in their connection to other vessels. The posterior trans‐cochlear sinus connects from the endocranial opening of the prootic (venous) sinus through the pars cochlearis to the inferior petrosal sinus. This suggests that in Borealestes the prootic sinus was connected to the inferior petrosal sinus. The posterior trans‐cochlear sinus is confluent with the prootic sinus, and then exits through the prootic canal passing through the lateral trough of the petrosal (see Wible & Hopson 1995 and Rougier & Wible 2006 for overviews of the prootic canal in cynodonts). This vascular channel connection is a new finding and has not been previously documented in other mammaliaforms. However, the lack of these trans‐cochlear sinuses in other mammaliaforms could be due to the fact that the interior structures in the petrosals of other mammaliaform have not yet been examined by such high‐resolution μCT scanning as in our study of Borealestes. The preserved features on the anterior and posterior paroccipital processes and in the mastoid region in the right petrosal of Borealestes (Figs 5, 6) are almost identical to the more complete homologues in Haldanodon (Ruf et al. 2013). The major excavated (presumably pneumatized) structures in these regions, and the degree of vascularization in the bone that form them, is similar in Borealestes and Haldanodon in the following: the entoglenoid recess (partly preserved); the well‐developed paroccipital plexus; the prominent paroccipital pneumatic recess on the ventral aspect of the posterior paroccipital process; the depth of the stapedial muscle fossa; and the deep mastoid pneumatic recess. The pneumatization of the exterior surface structures in the paroccipital and mastoid regions of the petrosal, and high degree of vascularization in the bones forming these structures are unique and derived features of Borealestes and Haldanodon, and possibly of docodonts as a group. The overall morphology of the inner ear of Borealestes is similar to that of Haldanodon, and implies similar hearing capabilities in these two genera of docodont. The vascularization in the petrosal of Haldanodon, the presence of a paroccipital pneumatic recess, and curvature of the cochlea were all considered to be evidence in support of a fossorial lifestyle in that genus by Ruf et al. (2013). This was coupled with features such as vascularization in the rest of the basicranium, and thicker lateral and posterior semi‐circular canals (Ruf et al. 2013). As these additional features are not preserved in Borealestes, we can only tentatively infer a similar lifestyle for these two taxa. The hypothesis about a fossorial lifestyle of Borealestes can be tested when the postcranial morphology is more fully revealed; the petrosals described here are part of a larger morphological study of a nearly complete specimen of the Borealestes skeleton NMS G.1992.47.121.1 (currently under study by EP). The additional cranial material, coupled with postcranial elements, are expected to shed further light on the palaeobiology of Borealestes in the future. The high‐resolution of our computed tomography and synchrotron scans has enabled us to characterize the details of the vascularized structures of the petrosal of Borealestes, and provide the first endocranial view of a docodont petrosal. This has led to the identification of two previously unknown structures: the anterior and posterior trans‐cochlear sinuses. This has also made it feasible for us to develop an overall reconstruction of the vascular and innervation structure in the petrosal. Despite post mortem crushing and the displacement of fragments of the petrosal and stapes inside the cochlear canal, we have been able to digitally reconstruct broken fragments of the petrosal and stapes. This reveals a more or less circular fenestra vestibuli and stapedial footplate, with a bullate morphology, as in Haldanodon. There are broad similarities in the morphology of the petrosal of Borealestes to that of Haldanodon, from which we tentatively suggest a similar ecology for these two docodonts. Further skeletal material currently under study will allow us to further explore the ecology of Borealestes, and add to our understanding of ecomorphologcal diversity in Docodonta. We would like to thank I. Butler at the University of Edinburgh for his time and expertise acquiring μCT scan data, and Vincent Fernandez at the ESRF for acquiring and reconstructing our unusually challenging synchrotron data. EP was funded by NERC, grant number NE/L002558/1, and synchrotron scans were allocated by ESRF. JAS was funded by the DAAD during this study, project 57073880. Z‐XL was supported by the Division of Biological Sciences of University of Chicago, and by the National Science Foundation during this study. We are also grateful to National Museums Scotland for easy access to their collections and equipment, and the advice and guidance given by S. Walsh and N. Fraser from the museum's Natural Sciences Department. Our thanks to Brian M. Davis and Eric G. Ekdale who commented on an earlier draft of the manuscript.